The difference between a porpoise vs. dolphin can be difficult to spot unless you look closely. You can spot the difference because dolphins have elongated mouths or beaks while porpoises have smaller mouths. A dolphin also has a curved dorsal fin on its back compared to a porpoise has a triangular dorsal fin. Lastly, they have different teeth shapes, a dolphin has cone-shaped teeth versus a porpoise has spade-shaped teeth. If you didn’t already know better, you might think porpoises and dolphins are the same species of animal. The terms are frequently used interchangeably by people, and they look quite similar in many respects. However, there is a genuine difference between porpoises and dolphins. Knowing the difference between the two kinds of animals will help you distinguish them from one another and remember how they ought to be treated. Dolphins and porpoises are both marine animals belonging to the scientific order Cetacea. Both porpoises and dolphins have bones (unlike sharks) that support their bodies and enable them to jump out of the water. The smallest dolphins and porpoises can be about the same size. The general shape of a dolphin and porpoise is the same. Both species subsist on a variety of small fish and other sea creatures. The primary way of distinguishing a porpoise from a dolphin is by their nose/mouth, dolphins usually have much longer snouts than porpoises do. Dolphins have larger mouths overall, have dorsal fins with sharper curves, and are generally leaner and more aerodynamic looking than porpoises. The two creatures also have different social habits. Dolphins are more social than porpoises, whereas porpoises are more solitary in nature. That covers the basic differences between dolphins and porpoises, but there are other differences that will become apparent if we take a close look at how both porpoises and dolphins live and reproduce. Dolphins can be between 4 ft long to 30 ft long (in the case of orcas). Dolphins have pointed conical teeth that they eat their prey with. Dolphins are much more diverse than porpoises, as there are around 32 different species of dolphins. These species can be found all throughout the world, in both temperate tropical regions of the ocean. Five species of dolphins even live in the rivers of the world. Dolphins are quite social and enjoy living in groups of between five to a few hundred individuals. Dolphins hunt together, using their ability of echolocation to locate their prey. They’ll surround schools of fish, fencing them in with their numbers and then take turns swimming through the groups and fish and eating. Some dolphins are even opportunistic scavengers which will follow fishing boats and whales to feed on discarded fish. Their social inclination even extends to other animals, and they are often very unafraid of humans, curiously approaching them. Part of the social aspect of dolphins is that they can communicate in a number of different ways. Dolphins are quite noisy, making a variety of clicking, squeaking and squawking noises. The sounds that dolphins make in the water reverberate off their environment, coming back to them and giving them information about the world. Dolphins are very agile and energetic, leaping out of the water to get a view of their environment. This process is sometimes called spy-hopping. Dolphins will synchronize their movements with one another as well. Dolphins may conserve energy by riding alongside the currents made by ships, which is called bow-riding. Dolphins typically mate in the spring and fall seasons. The female dolphins undergo a fairly long gestation cycle, somewhere between 9 to 17 months depending on the exact species and the individual. A young dolphin calf will stay with its mother, nursing for between 11 months to 2 years. Dolphins may even stay with their mothers for another 1 to 5 years after they are done nursing. Porpoises tend to be smaller than dolphins on average. They are usually around 5 feet to 8 and a half feet long. In contrast with dolphins, there are much fewer species of porpoises in the world. There are only 7 known species of porpoise, and these species are only found in the Pacific ocean. Porpoises can handle channels and rivers as well, much like dolphins. While dolphins are very social creatures, porpoises are less social. They typically live by themselves or in small, ephemeral groups which break up quickly. This means that porpoises are solo hunters. Porpoises track down small groups of fish, octopus, squid, and crustaceans to eat. Porpoises need to eat around 10% of their weight in food a day. Unlike dolphins which have conical teeth, the teeth of porpoises are rounded and have a flat surface like a shovel. While dolphins are quite talkative, porpoises are fairly quiet. They don’t vocalize to communicate with other porpoises as often, a result of their more solitary lifestyle. The exception to this is that both porpoises and dolphins echolocate. Porpoises also tend to be more wary of humans, avoiding them. Porpoises have stockier bodies than dolphins do, and some porpoises are even “finless”. Despite their more rounded bodies they can still jump out of the water and are still swim very quickly. Porpoises have live births, much like dolphins, since they are both mammals. Female porpoises usually have a gestation period of around ten and a half months, and usually, birth only one calf at a time. Porpoise calves are usually weaned within two years and can be sexually mature when they are anywhere between 2 to 8 years old. Since the reproductive cycle for porpoises is shorter than for dolphins, porpoises can have calfs every year. 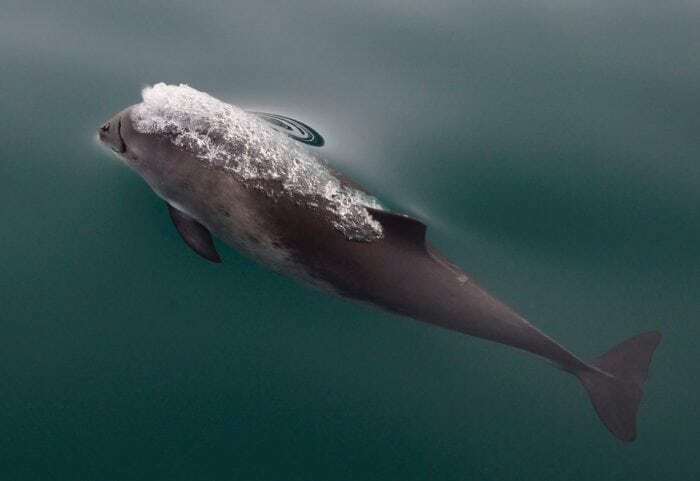 The quick reproductive and maturation cycle of a porpoise may contribute to their shorter lifespan than dolphins (dolphins may live up to 50 years while porpoises typically live between 15 to 20 years). 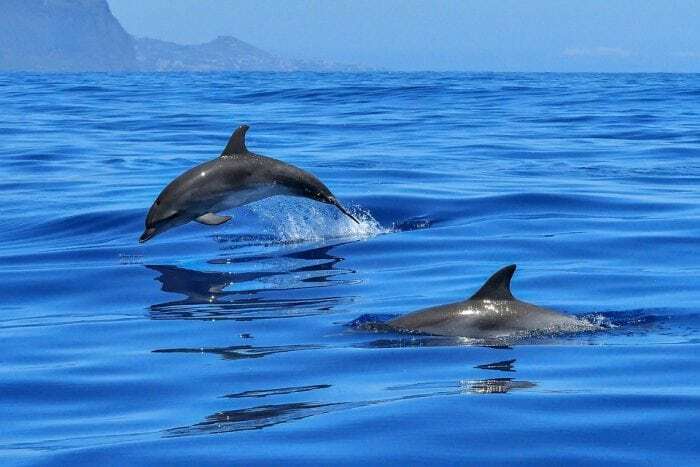 The rapid rate at which porpoises reproduce and mature may take more a toll on their bodies, in contrast to the lengthier maturation rate of dolphins. Some species of porpoises are endangered, like the critically endangered Vaquita porpoise. They are endangered for a variety of reasons, including hunting and climate change. The easiest way to tell dolphins and porpoises apart is that porpoises don’t have narrow snouts like dolphins do. Dolphins are much sleeker and more aerodynamic looking than porpoises. Dolphins are more social than porpoises, and make a wide variety of sounds, while porpoises are fairly quiet. Finally, porpoises are usually only found in the Pacific ocean, while dolphins can be found all over the world.